Parking-by-the-metre parking is available all the way along North Street at £1 p/hour, with a maximum stay of 3hrs. A five minute walk away are two free carparks called Diamond Street Car Park and Sheene Road Car Park, both free for a maximum of three hours. Do you have space for buggies? Yes we have a small buggy park available on a first come, first served basis. We can usually fit 5-6 single non-folding buggies here. We encourage customers to bring a folding buggy or a sling if they are able to, especially during busy periods to guarantee entry. We are open Monday to Friday 9.30am to 3.30pm. We open on Saturdays and Sundays for private hire (for information on booking parties see below). Is my baby the right age for the cafe? All babies are the right age for the cafe, we welcome babies, parents and parents-to-be of all ages and walks of life to come and enjoy our facilities. Older siblings are welcome, when choosing toys for the cafe we had 0-2yrs in mind. Do you serve food for little ones? Yes we sell food for babies and toddlers. Made fresh to order we have Baby Grazing Plates consisting of piles of chopped grapes, cucumber, Cheddar cheese, breadsticks, rice cakes and raisins. For something warm we have bowls of pasta with a fresh Five Veg Sauce (literally five vegetables cooked and blended up, nothing else) and optional grated cheese. For snacking we have homemade animal biscuits, free from sugar, salt and dairy as well as Ella’s kitchen pouches and amazing spelt, coconut and banana flapjacks from Little Blue House. We ask that you don’t bring your own food to the cafe unless your baby has food allergies. Please get in touch if this is the case so we can expect your visit. Do you serve food for grown ups? Indeed we do! We make fresh panini’s with three different fillings. These are served with a hearty side salad and a generous handful of sea salt crisps. We have lovely homemade soup. For breakfast we serve hot porridge, made fresh to order, topped with honey raisins and cinnamon. There is always cake available! We also sell warm crumpets and crisps. Do you cater for dairy free/vegan/gluten free? Yes we do, we always a have dairy free panini filling available and our soups are often vegan. We have gluten free and dairy free bread available. We can alter dishes for dairy and gluten free babies too. Why do you have a shoes off policy? We keep the cafe very clean for babies to enjoy being on the floor without you having to worry, and we don’t want any little fingers to get stepped on either. Staff must wear clean shoes when working by health and safety law. Where can I book classes? Classes can be booked at https://themilkshed.eventbrite.co.uk. Support groups are free unless otherwise specified on the event page. Parties can be booked at https://milkshedprivatehire.eventbrite.co.uk where you can see available dates, prices and all the things we offer such as food, disco lights, bubble machine and entertainment. We can even do your cake! Our party rate is £80 for 3hrs exclusive hire of the Milk Shed including a barista to make you hot drinks. We have morning and afternoon slots available 9.30-12.30 or 1-4pm on both Saturdays and Sundays. We will do our best to make your event as special as possible! How often is the lactation consultant in? The Milk Shed wants to ensure mums get all the help they need, so we pay for a lactation consultant to visit Cherubs Breastfeeding Support Group once a month. Cherubs takes place every Monday 1-3pm – details of when our lactation consultant visits are on our Facebook events. Do you sell gift vouchers? What can I use these for? Yes we have £5, £10 & £20 gift vouchers available. These can be used on food, drink, classes and most retails items. Can I reserve space to meet my friends? Yes, on a Tuesday, Wednesday and Thursday afternoon 1.30-3.00pm we can reserve our top space (subject to availability) for groups between 6-10 adults and their babies, providing you each order lunch & a drink. Are Dads welcome? Absolutely! 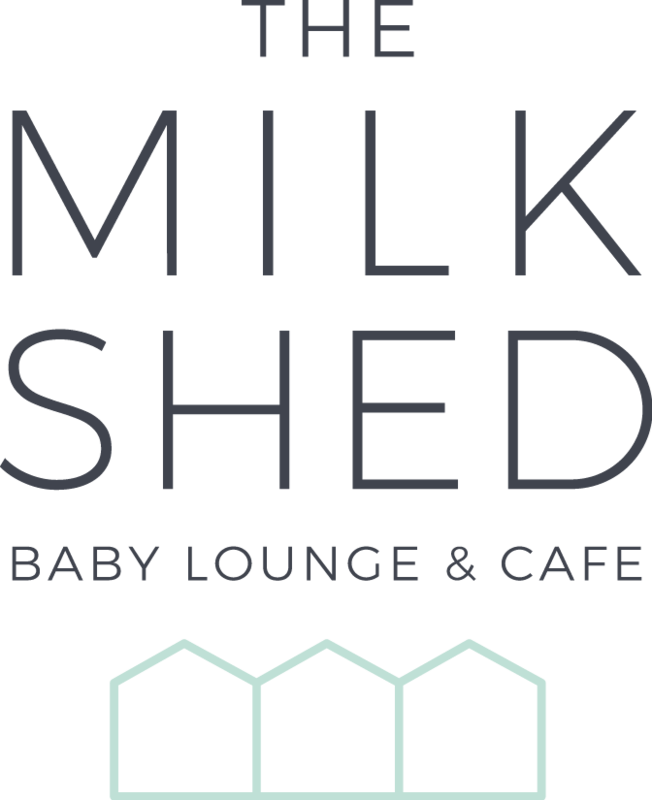 The Milk Shed is not just for mums. We welcome dads, grandparents, aunts, uncles, nannies and other carers into our space with open arms.